Safe Harbour: Respect for All program coordinators are busily re-engaging locations to refresh their commitments, invite them to submit testimonials and diversity-related stories, and offer additional diversity resources. AMSSA and our partners welcome the Comox Valley Airport, our latest Safe Harbour-certified location! AMSSA is excited to announce that the Safe Harbour PSA’s are now being aired on several additional radio stations: The Wolf 100.3 FM in Quesnel, CFUV (101.9 at the University of Victoria) and 103.1 CKMO, village 900 am: global roots radio(Camuson College). AMSSA wishes to thank all stations for promoting the Respect for All – Pass It On! campaign to their audiences. 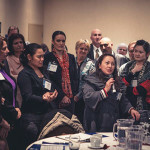 AMSSA is pleased to announce that the United Way of Lower Mainland will continue to fund our Newcomer Children’s Champion program for 2011-2012. Over the next year, we will publish new editions our ANCIE e-bulletins on key migrant children topics; investigate and document best practices in early childhood programs for immigrant and refugee children; engage with academics, service providers and policy makers regarding the development and application of a “culturally competent” Early Develop Index; and be involved in other initiatives to promote improved outcomes for migrant children. AMSSA would like to thank all of the presenters for their contribution. AMSSA gratefully acknowledges the United Way of the Lower Mainland for its financial support. The videos of the presentations and Q&A session will soon be available on the AMSSA Newcomer Children Information Exchange (ANCIE). Please click here to access the website. 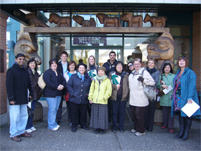 On March 23, 2011 AMSSA hosted two full day study tours for delegates of the 2011 Metropolis BC Conference. AMSSA coordinated the tours each focused around a different side of urban geography and the evolution of immigrant service provision. One of the two tours was focused on immigrant and refugee services in an urban core and participants visited Immigrant Services Society of BC’s Welcome House and SUCCESS. They were also given a walking tour of Chinatown led by the City of Vancouver’s Social Planning Department. The other tour focused on immigrant and refugee services along the transit corridor. This tour travelled along the Skytrain and delegates visited Collingwood Neighbourhood House, MOSAIC and DIVERSEcity Community Resources. A big thank you to the organizations who hosted the tour delegates – your thoughtful presentations made the event a great success! Volunteers in the lobby greeted thousands of visitors with a vibrant green tote-bag of goodies and from our generous donors and sponsors. 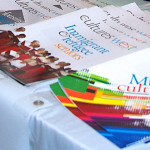 Multilingual volunteers offered visitors guided tours of the fair. The Exhibitor Hall featured over 50 health and wellness focused organizations, such as Canadian Diabetes Association, HealthLink BC, MOSAIC, and UBC faculty of Dentistry, prepared to share culturally relevant information, engage and educate. The socially inclusive environment they created successfully promoted equality and worked to eliminated barriers immigrant and newcomer population face in accessing health care. This year’s Health Screening room, operated by Vancouver Coastal Health and Hear at Home Mobile Clinic, was a hit. Many visitors enjoyed free health checks including blood pressure and blood sugar testing, nutrition and diet consultations, and both physical activity and hearing assessments. Cooking Demonstrations were always bustling audiences learned how to cook delicious, healthy dishes, using a variety of new recipes and techniques. 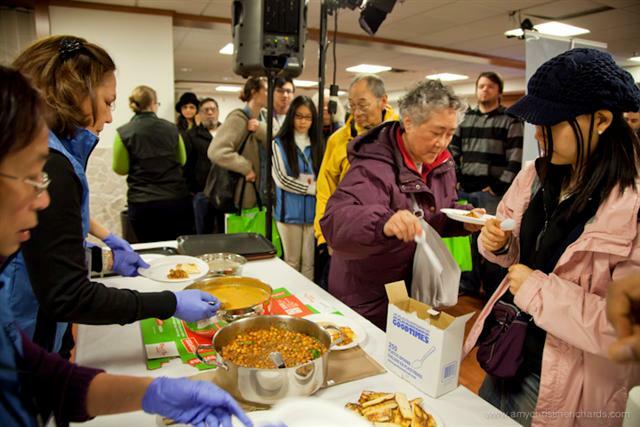 Attendees tasted and tried flavourful creations ranging from homemade granola to healthy butter chicken. 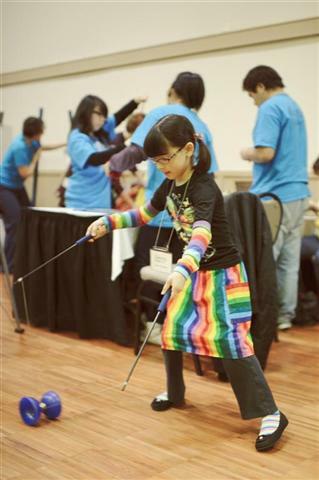 The Interactive Hall spearheaded by Vancouver Parks Board, featured the kids activity zone- a place for exciting and educational and interactive activities like button making inline sledge hockey, circus arts, gymnastics/tumbling, a softball pitch, and a fruit and veggy hunt. Some highlights from the stage included the Shanti Mala Collective a Nia fitness workshop, Mukatano, Volunteer Band of Vancouver and Estilo Cubano. If you would like to be taken off the AMSSA Insider distribution email list, please respond with the subject “unsubscribe”.